Bigger Celebrations need greater care! Your once in a lifetime party deserves and an individual magic touch. The catering experience and expertise of Biligiri professionals will always ensure quality and service that you deserve. Be it a get-together for 200 people or a large function for 5000 guests, we ensure that everybody is delighted. Complete hygiene, combined with choicest cuisines and exceptional service with competitive pricing will ensure that you really celebrate. We understand the importance of showcasing and representing your brand in a unique way. Therefore, Utsav caterers are really good at customizing menus, themes and service styles to exceed yours and your guest’s expectations. For one of the most important events in your life, We focus on creating an elegant and personalized experience with beautiful presentations, and by creating a flavorful and unique touch for your wedding for all to remember. With 16+ years of experience catering to life’s most memorable events, Utsav can handle all the details while you enjoy your own party. Be it birthday parties, family get-togethers, and cocktail parties, you can count on us. Guests always look for culinary creativity along with engaging service, they find in their favorite restaurant, but they want to recreate that environment in the setting of their choice. Your event doesn’t have to be just the formula based “starters, main course, or desserts”. We feel that the food and landscape should be as dynamic as the conversations your guests have at your event & that’s where we come in. The love and the kind words of appreciation is really the secret ingredient of our success and the key reason for us to comeback. Its one of the best vegetarian restaurants in town and the ambience is perfect. How can you go wrong with a restaurant recommended by the who’s who of Hyderabad. The last time I had been to Utsav was a long time ago but my time at the restaurant lingers in my mind even today. One can enjoy food leisurely.We have visited number of times because Cody atmosphere and tastyness. Service was friendly as usual. Good show, keep it up guys! Looking forward to my next visit. Utsav is a vegetarians paradise. They make being Vegetarian, a worthy feeling, with some amazing dishes that they make. Good place for Veg lovers. Go for the buffet. Lavish spread of deserts and sweets. A good assortment in dinner buffet. Starters and soup(s) were served at table. It is a very nice hotel and good value for money It has all the requisites like chat, starters, soup, main course and deserts. Ambience is good and staff is courteous. A good option in Hyderabad for buffet if you are a vegetarian. Tasty food! Especially the live counters are too good. Chocolate Dosa is one of its kind and interests children’s at core. One of the well known “Pure Vegetarian” restaurants in the city. Known for its Buffets, this place is a must visit atleast once. 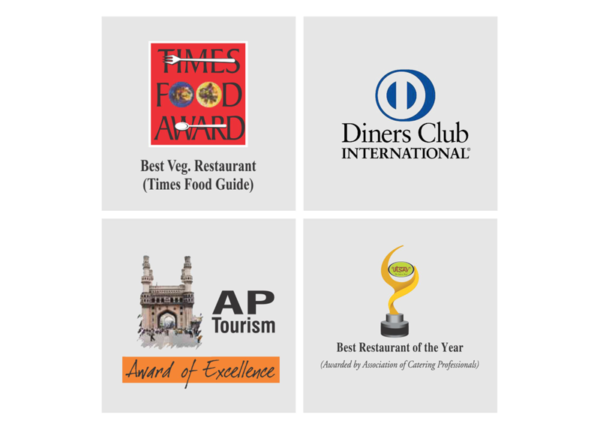 Utsav is the only restaurant to have won all the four awards by Association of Catering Professionals, Diners Club, Times Group and AP Tourism. This recognition and awards bestowed on us is a constant reminder for us to serve you better and delight you always.